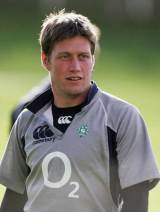 Ronan O'Gara was one of Munster's great players and holds the record of being the all-time top points scorer in both the Heineken Cup and for Ireland. He made his Ireland debut against Scotland in 2000 aged 23 and entered into a fierce competition with Ulster's outside half David Humphreys for the No.10 jersey. He won a place on the 2001 Lions tour, although he did not play, but by the 2003 World Cup he was a regular in the Irish side and the following Six Nations saw him emerge as an international talent, as he helped Ireland to their first Triple Crown in 19 years. He was again a Lions tourist in 2005, but found stiff competition from Jonny Wilkinson and Stephen Jones limiting him to only a replacement appearance in the third Test against New Zealand. After the 2005 tour, he returned to Munster and helped guide them to the 2006 Heineken Cup title against Biarritz. Exuding confidence, O'Gara became arguably the finest fly half in the northern hemisphere, with a deadly attacking arsenal and a new found belief in his ability to challenge even the stoutest defences. The 2007 Rugby World Cup proved to be a difficult time for O'Gara however, as Ireland's stuttering performances were compounded by wild media speculation surrounding aspects of his private life. He returned to Munster colours to help them to another Heineken Cup victory in 2008, when he landed the penalty that sealed a 16-13 triumph over Toulouse in Cardiff. O'Gara started all of their 2008 autumn internationals including their bad-tempered win over Argentina. A standout year followed in 2009 when he became the all-time leading points scorer in the history of the Six Nations before steering Ireland to an historic Grand Slam. His late drop goal against Wales in the title decider at the Millennium Stadium ended a 61-year drought for Ireland's second clean sweep. He was then selected for the 2009 Lions tour of South Africa and made the squad for the first and second Test. He stayed on the bench for the first Test defeat in Durban but came on as a late replacement in the second Test in Pretoria. In the last minute, with the scores tied at 25-25, he tried an ambitious up-and-under before taking out Fourie du Preez in the air. Morne Steyn kicked the resulting penalty as the Lions suffered heartbreak over another series loss. O'Gara was replaced by James Hook on the bench for the third Test. In November 2010 O'Gara came off the bench against South Africa to win his 100th cap for Ireland, becoming his country's third Test centurion. And he reclaimed the Ireland No.10 shirt during the 2011 Six Nations, steering his side to victory over Scotland at Murrayfield with a vintage display. He continued to vie for starting shirt with Jonathan Sexton as Ireland went into the 2011 Rugby World Cup. Sexton started the opening games but O'Gara was chosen for their crucial pool clash with Italy and retained the jersey for the quarter-final defeat to Wales. While his club form remained superb, he dropped behind Sexton for Ireland's Six Nations campaign and he failed to score any points in the tournament for the first time since 2000. He was a peripheral figure in the 2013 Six Nations and he retired at the end of the season to take up a coaching role with Racing Metro, where he will work with, of all people, Sexton.